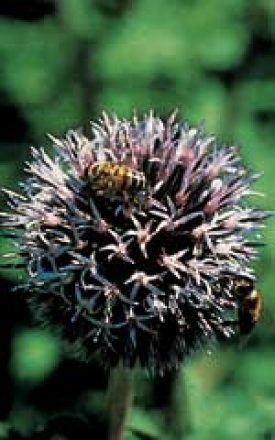 Globe Thistle Seeds 6445. This plant makes a splendid contrast to most other flower forms in the perennial garden. Globe thistle produces long lasting masses of globular, spiked, violet-blue flowers on solid tall 75-90 cm (30-36″) stem. Thistle-like foliage is finely cut with a saw-tooth shape tipped with not too prickly spines. A pollinator favourite – in particular bees! Other than cutting down the stems after flowering is finished, Globe Thistle is about as a low maintenance a plant as it gets! Hardy to Zone 3. 75 seed/gram. “Globe Thistles” as they are commonly referred to, are large, dramatic plants that are impressive in the garden or as dried flowers. Start indoors in a soil-less mix in early March. Press seed into the mix but do not cover as light aids germination. Germinate at 21 C (70 F) then grow on under lights at a slightly cooler temperature then harden off and transplant to a sunny spot in the garden. 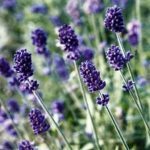 Seed can also be directly sown in the garden in August and early September for flowering in the following year. An absolute pollinator magnet!, Dried flower, Great for vertical colour, Low maintenance plant for the sunny garden, Unique foliage and flower form!